The Valley MetroRail light rail transit system in the greater Phoenix, Arizona metropolitan area has been in operation now for five years. When it opened for business for all intents and purposes in Jan. 2009, for the 20-mile, 28 station, $1.4 billion so-called “starter” system, average weekday boardings were projected to be 26,000. In 2012, that figure was 43,268. Average daily in 2013 was 43,619. Looking at the numbers a little more closely, 20 miles of light rail line translates to 40 miles (2 railway tracks x 20 miles/track = 40 miles). At $1.4 billion that works out to a per-mile cost of $35 million (and includes in that the cost of the procurement of rail rolling stock, overhead electrical catenary infrastructure, and a maintenance facility and rail yard to maintain and store the trains). This compares to the typical per-lane-mile highway construction cost of $25 million. Remember, this is absent vehicle traffic. When factoring that traffic in, the capacity of 1-lane-mile of highway using a travel speed of 60 miles per hour is 2,400 vehicles per hour. A constant traffic flow at that capacity over a 24-hour stretch would equal 57,600 vehicles. Assuming 75 percent of vehicles contain just a single occupant, over that 24-hour time frame, 43,200 people could be accommodated and rather handily I would add. And, if the remaining 25 percent of vehicles averaged 2 passengers per vehicle, that would add another 28,800 more people to the mix and therefore produces a total of 72,000 highway users. But, it doesn’t matter whether that is over a freeway distance of one mile or 20 miles – the capacity would still be the same. Remember, we’re talking only one direction of travel. Now add another travel lane for vehicles traveling in the opposite direction and another potential 72,000 highway users could be added for 144,000 highway users total. So, at $25 million per highway lane-mile for construction, at 20 miles this works out to $500 million. 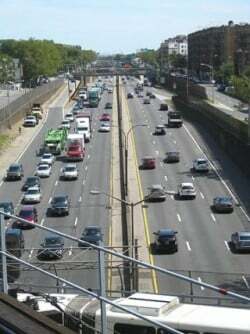 With a minimum of two lanes needed over that same distance, the total construction cost is $1 billion. More than likely, less than that optimal 144,000 highway users would realistically travel the typical two-lane highway (with 60 mile-per-hour speed limit) on a daily basis. That’s my take. In the highway example, what is missing are the costs associated with vehicle purchases. Assuming an average cost of $20,000 per motor vehicle, at 115,200 vehicles (57,600 vehicles over a 24-hour period per direction of travel) this comes out to a total motor vehicle investment of $2.304 billion – and that is on top of the highway construction costs, the cost of which is split among taxpayers or highway users or both. It should be noted, however, that if any of the highway users are commuters, this is going to affect the way in which numbers are counted. Say, for example, 70 percent of metro highway drivers are commuters. Their vehicles should not be counted twice, but once. So, in reality, instead of there being 115,200 different vehicles in all using the highway over the 24 hours, instead there would only be 74,880 (57,600 vehicles x .3 = 17,280 vehicles + 57,600 = 74,880 vehicles) traversing the highway (2 directions) in question over the course of a single day. At 74,880 vehicles, this would put total vehicle purchase investment at $1.497 billion. Either way, I would classify such vehicle purchase investment as a highway operational cost and doesn’t include in that the purchase of gasoline and/or electricity. But still. Using the railway, to accommodate the same number of users, would require 1,800 train-car loads of passengers in a 24-hour period and that’s based on a capacity of 80 passengers per train car. If each trainset consisted of four train cars, which is typical, accommodated are 320 riders. Using 10-minute headways or six trains per hour, at full capacity, moved in that time space are 1,920 riders and that’s per direction of travel. Spread that out over 24 hours (assuming an around-the-clock operation), the travel needs of as many as 92,160 light-rail riders could be adequately met. Realistically, though, since on the Valley MetroRail light rail transit system ridership is roughly forty-three-and-a-half thousand daily, obviously not as many light rail trains would need to be procured. However, if more equipment is ever needed more train-cars/sets could be secured. Realistically, as well, highway capacity like that mentioned above would typically be handled by four and not two lanes of roadway which doubles construction costs. So, for 20 miles, we’re looking at a construction cost of $2 billion instead of $1 billion. So, weighing all factors, dollar for dollar, railways go so much farther in terms of handling capacity than do highways, all things being equal. But the real beauty of this whole conversation is that with the railway versus the highway, the difference in regard to energy/emissions-savings is like night and day. Historically, in this regard, railways have come out on top. Keeping this in mind, there is very strong interest in building a high-speed (205 mph) rail line connecting Dallas-Ft. Worth and Houston (a distance of 250 miles) and a magnetically levitated train between Baltimore and Washington, D.C. (a roughly 50-mile distance). Again, roadways versus railways, which is the better value? Good approach to count the cost of the vehicles using the highway, and your light rail capacity calculation is reasonable (I use the Los Angeles Blue Line at 10 trains per hour x 3 cars per train x 100 passengers per car including some standing = 3,000 passengers per hour per direction). But I’d note that highways are built for peak-period demand, not an average over 24 hours, and at peak period congestion a freeway lane carries fewer than 1,500 vehicles per hour. Darrell, thank you for providing the added insight. What I was hoping to show was a direct comparison of roadway vs. railway traffic under free-flowing conditions. … And the reason(s) for this. In the U.S. there seems reluctance among many regarding building new rail lines – especially high-speed. If it could be explained that, based on economics (among other factors), rail line construction is more cost effective than is roadway construction – highways, mainly – which I attempted to show here, then, in considering such use under free-flowing operating conditions, readers reading might gain a greater appreciation regarding the value of such railway building over roadway building as compared to such under peak demand or use. It appears in the Los Angeles area, people understand this. I’d be interested in a comparison with lifecycle costs figured in: maintenance (including snow clearing), policing , fare and toll collecting and other costs associated with each type of transportation. “I don’t [know] if anyone has recently systematically looked at lifecycle costing of operations and maintenance (I did this a long time ago http://nexus.umn.edu/Papers/FullCostIntercityHighways.pdf , but it was fairly coarse ), but the annual operations cost of the various modes are published in federal statistics and average (though not marginal) costs can be estimated fairly readily. See e.g. “In Arizona, Maintenance costs e.g. are about $100 per vehicle per year. In Minnesota they are almost 3 times that (we get snow & freeze/thaw). You can life-cycle this if you want to assume an interest rate (though I think it makes more sense to think of maintenance (and capital) as a flow (annual expenses) than a stock (i.e. a life-cycle cost)). “I am not as convinced of the energy savings claims. Clearly a full bus or train is better than an empty car, but a full car is better than an empty bus or train. Trains and buses have a lot of metal (mass) that needs to be moved, and are not efficient when not full (generally most of the time outside rush hour, outside the peak direction). This leaves aside the higher travel times typically on transit (so it is less efficient for users). “Sadly, load factors are not what they might be (there is lots of excess capacity on all these systems). “… Overall bus actually does a little worse than car, and rail a little bit better, though it of course varies locally. The good news is everything is getting better in the past decade. Thank you for putting some actual numbers to something that isn’t nearly as often the subject of discussion that it ought to be! No surprise to me that rail comes out on top. While HSR would be nifty, it’s really not needed, and we’re likely to get a lot more bang for our buck building other forms of rail first. We need to get Americans past this perception drummed into them via media that trains are somehow obsolete — a message they’re getting even as the corps telling them this are fighting to get their products on the very, *very* busy freight schedule. Speaking of very, *very* busy freight? Let’s start building that trackage. It’s desperately needed. By “building other forms of rail first” I take it you are referring to urban and commuter rail? How I see this, I am looking at it from the standpoint of air quality. Where I reside in the San Joaquin Valley, without HSR, the likelihood that air quality will significantly improve is remote at best, doubtful at worst. With continuing increasing growth in population in the Valley which, for the most part this has equated to more horizontal sprawl, the answer mobility or transportation-wise to date has been to build more roads in response. With more roads come more cars and trucks and with more motor vehicles will be more pollution. The current mold could be broken with HSR. Should a HSR system in California get built, meanwhile, the potential is strong for connecting systems such as light rail and/or streetcars to crop up, coupled with existing rail such as the Amtrak “San Joaquin” trains, to serve as feeders bringing travelers to and taking them from the centrally located downtown Valley-based HSR stations, for example, in Bakersfield, Fresno, Merced and eventually Stockton in the north Valley. To bring this about will take visionary leadership on the parts of Valley powers that be. Conversely, by maintaining the status quo, San Joaquin Valley air quality will likely grow worse before getting better. On the other hand, HSR could be the catalyst or impetus to drive feeder rail interest where there would most likely be none otherwise. In other places around the country, meanwhile, the other forms of rail that you mention just might be the better bet. You make a serious cost underestimate for highways in your article – you state four lanes would be double the cost of two. In reality, it’s more than double. There is no “economy of scale” with highway expansion – as the highway gets bigger, then benefits get less and the cost gets higher. Going from 2 lanes to 4 lanes doubles capacity (simplified). Going from 4 to 6 only increases by 50% but costs more than the first widening. 6 to 8 only increases by 33% and costs a lot more when you consider the bridge replacements, retaining walls, working around a city built around a smaller highway, complex interchanges with C/D lanes, etc. Rail doesn’t have this escalating costs problem. But what about the cost of all the helicopters to get to the rail stations? And the cost of the jets to get to your destination when the trains aren’t running?! Oh, and the cost of hiring a gold-plated limo to go to the mall?!?!? What would be the overall cost if you got rid of all cars and roads and relied only on trains? And how would that compare if you got rid of all trains and rail tracks and relied solely on cars? By the way: do these light rail lines carry freight cars?! Allowing for inflation which was cheaper ton/mile on the Hindenburg vs 20 Century limited? New York City NY. to Los Angles Ca. in how Japan is a major exporter of automobiles in the global economy, when a great deal of their population travels by rail. If you have not already read the post: “Fifty years in the making: American high-speed rail,” this may be of interest as well. Reference in this post is made to the article: “How America Led, and Lost, the High-Speed Rail Race” by Mark Reutter. Railway is of better value in term of capacity and protection of the environment. Train travel is much safer than car travel. Any thoughts on self-driving vehicle operation and whether or not you think such will move ahead of train travel as the safest means of transportation anytime soon? Or, ever, for that matter? The rail could also be electrified to make the cars hybrid, so that they would not need gasoline at while on the rail, and would simply have an electric meter to pay for costs; and it could be read by mobile app. America could stop importing oil altogether. With the current movement to word self-driving Vehicles, rail friendly cars could be an ideal solution. Your post misses the fundamental problem in large cities, which is space. Using a single train cars allows you to fit 200 people in the same space required for 5 cars. Changing light rail to a self-driving car path would reduce capacity by ten times. you are right that single train car allows you to fit 200 people in the same space required for 5 cars, but it will not be nearly as comfortable as driving in a car. I use train every day and every day i deal with horrible smell, the usual standing, the crazy people, and oh god horrible crushing crowd in peak hours. I honestly can’t wait to switch to car, it’s not always about math when there’s people factor involved. You may be interested in reading “High-tech highways: ‘Hands-free,’ ‘pavement-powered’ vehicle platforms?” and “High-tech highways: Charging car batteries for life” here: https://alankandel.scienceblog.com/2013/05/05/high-tech-highways-hands-free-pavement-powered-vehicle-platforms and here: https://alankandel.scienceblog.com/2013/05/06/high-tech-highways-charging-car-batteries-for-life. The ideas presented are very similar in principle to what you mentioned above. Finally, Interactive routing apps could ensure Optimum usage of the rail system to maximize the flow of traffic, since every vehicle I would be in contact with the rail systems Central Computer at all times. With the current movement to word self-driving Vehicles, rail friendly cars could be an ideal solution– particularly since rail already directs the vehicle that occupies it to follow the rail precisely, and there would be no need for advancement of existing systems in order to utilize it. As cars become autonomous I’m wondering whether we will move to low occupancy rail vehicles instead of autonomous fleets of cars. It would involve replacing roads with rails. It would be safer – less danger of errors and hacking because the direction would be determined by the rail. I think it’s just a historical accident that personal vehicles were patterned after the horse and buggy rather than the train. If things had happened a little differently we might all be driving personal rail cars instead of cars. It sounds a lot like you’re describing rail-based personal rapid transit (PRT). Personally, I have more confidence in systems like PRT than I do in an across-the-board self-operating motor vehicle platform – I think the technical challenges are just too numerous at this early stage of autonomous vehicle development. As to the matter of roads being replaced by rails, I don’t necessarily think that the former will be replaced by the latter but, who knows?! It could be that the roads-to-rails relationship will be more even-steven in time. “I currently live in San Francisco, where I don’t have to worry about the connection problem and just bike everywhere. In fact, I’ve been car-free for 7 of the 10 years I’ve lived here and regard the other 3 as a mistake. However, what works in SF is a lot harder in the rest of the Bay Area, and harder still in San Joaquin (I grew up in Stockton so I’m familiar with the way it is out there). I did once bring my bike on Amtrak and ride to UOP from the station, though, and I found that getting around Stockton by bike is a lot more practical than I would have assumed when I was living there and driving everywhere. It took maybe 20 minutes total vs about 12-15 driving. Most Americans have no idea how expensive it is for everyone to drive for most trips. Once you add up gas, insurance, registration, maintenance and repairs, payments, and depreciation, you’re looking at $500 / month on the low end. Then the taxpayer is footing a lot more to build and maintain roads wide enough to accommodate thousands of vehicles at gross weights up to 80,000 lbs and every business occupies about 3x the amount of real estate so there is enough space for everyone to park. While some people put out misleading statistics that make it seem as though trains are more expensive as highways, they use a lot of faulty assumptions. For instance, the per-mile cost of track is quoted against the per-lane-mile cost of highways, ignoring the fact that new track is typically constructed in the middle of dense cities, while new freeways are not. Try pricing a few miles of new freeway in the middle of a major city and see what it costs! They also point out that the fare usually only covers about a third of commuter rail’s operating costs, but fail to mention the percentage covered by fares to use the freeway (zero). Or, as Alan alluded to in his post, they count the cost of the trains that run on the track but not the cost of the cars and trucks that drive on the roads. If the monetary costs weren’t bad enough, we haven’t even accounted for the environmental damage, health costs from poor air quality and lack of exercise, and the fact that we have transformed our cities into places where there is a tiny amount of space reserved for actual humans and most of the square footage is a no man’s land where you can be run over and killed for daring to set foot. Even with all of the traffic control and regulation, there are still over 30,000 deaths in America from car accidents every single year. That’s the equivalent of 160 9/11’s since 2001. A lot of people with longer commutes would be happy to take a train and avoid the cost in time, money, and stress of rush hour commutes, but they don’t have a good solution for the 1-5 miles between their home and the station, and then the other 1-5 between the end station and their work. I would argue that the best solution is to bicycle, but it requires proper infrastructure for people to feel safe enough to do it. Bike lanes are not enough, and in many cases are actually more dangerous due to the risk of being doored or “left-hooked” by cars that make right turns across the bike lane without thinking to check their side-view mirrors. The truth is that bikes and cars are different animals and don’t belong together on the same roads. Plenty of cities have disconnected bike trails for recreation that don’t lead anywhere in particular. What we need are trails designed for commuters and physically protected bike lanes on streets where trails are not possible. Yes, it’s expensive to build, but in the long run it’s a lot cheaper, and given that municipalities have the ability to issue 30-year bonds at historically low interest rates, up-front cost should not be a deterrent. The other necessity is secure bike storage like the Bikelink lockers that we have in the Bay Area, where you can not only store your bike in a fully enclosed metal cage, but you can also leave your helmet and accessories and know that it can’t be stolen and won’t get rained on. If a significant percentage of the population were to bike, there would not be enough room on the train for everyone’s bikes, so storage lockers are a must. Then at the destination there needs to affordable bike share. This setup works equally well for short and long commutes, and can get people to their destination faster than fighting commuter traffic, often significantly faster. The reason none of this has happened yet is the chicken and egg problem of not enough cyclists clamoring for infrastructure, so the infrastructure doesn’t get built or is poorly designed by planners who don’t cycle, which means people are not encouraged to try commuting by bike and they don’t advocate for infrastructure. Wash, rinse, repeat. This might be changing, however, as the winner-take-all economy has left huge swaths of the population out in the cold, especially in the Millennial generation where so many have faced an adulthood defined by debt, high costs of living, and lack of opportunity. Truth be told, many people simply cannot afford to drive, but they see no alternative so they give up everything else or allow themselves to be trapped with no way to get around. Many cannot get jobs because they lack reliable transportation and are stuck in food deserts where they overpay for low quality meals. Widespread cycling and proper bike infrastructure would go a long way to cure the diseases of poverty and inequality, as well as raise the physical and mental health of the populace, save money for the taxpayers, and reduce the damage we inflict on our planet. As if that weren’t enough, bikes are just more fun! Ask any cyclist with the wind in their hair breathing fresh air whether they would rather be driving. The best way to improve transport is city planning and zoning. Driving everywhere is dangerous and wasteful. If people could walk or bicycle to the stores they need to go to it’s much better quality of life. As retail is floundering and many homes built in the US are past their life cycle maybe there is a chance to radically redevelop our living places in America to be much more safe and efficient. Bicycle is no solution whatsoever, speaking of children, older people or plain ole Chicago with -11 F in the morning.